As “market referees”, regulators contribute to the delivery of essential public utilities. Their organisational culture, behaviour and governance are important factors in how regulators, and the sectors they oversee, perform. 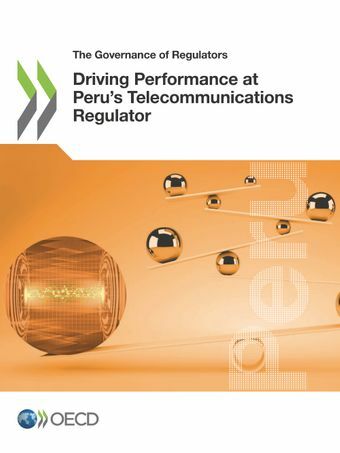 This report uses the OECD Performance Assessment Framework for Economic Regulators (PAFER) to assess both the internal and external governance of Peru's Supervisory Agency for Private Investment in Telecommunications (OSIPTEL). The review acknowledges OSIPTEL's achievements and good practices, analyses the key drivers of its performance, and proposes an integrated reform package to help the regulator prepare for the future. As one of four economic regulators created in the 1990s, OSIPTEL has overseen the transformation of Peru’s telecommunications sector and market into a competitive market benefitting the country’s citizens and businesses. It is viewed as a technically sound body that has delivered on its mandate over the years. Building on this reputation and its strong internal culture, a more proactive external relations strategy could strengthen understanding of the role of the regulator externally and could mitigate external risks. This strategy should aim to build a “no surprises” relationship with stakeholders based on trust and could, in the medium term, lay the groundwork for solutions to some structural challenges faced by OSIPTEL. These include ensuring that appropriate functions, resource frameworks and coordination mechanisms are in place. Moreover, there is scope to improve other areas linked to the regulator’s governance, such as building more robust and diverse internal decision making mechanisms, including at the level of the Board of Directors, strengthening transparency and accountability processes, and engaging with stakeholders more regularly to report on performance. For further information, please contact Anna Pietikainen.